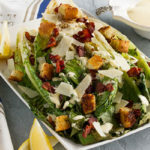 This delicious grilled caesar salad is a fun and classy way to serve a caesar salad to guests and especially great for a backyard BBQ with your family and friends. It’s delicious with some little charred bits and the homemade caesar dressing is so easy and good. You will never buy caesar dressing at the store again! Debbie and I are loving this grilled caesar salad. 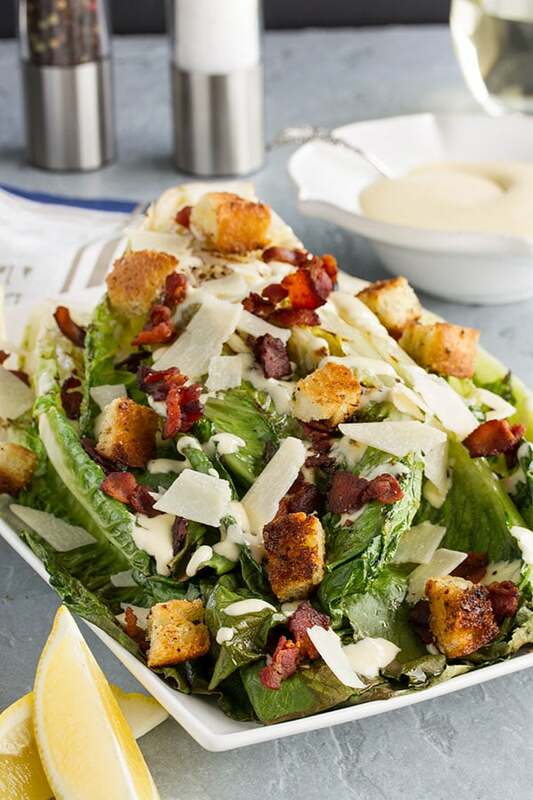 It tastes so good with that little char on them and this creamy, garlicy homemade caesar dressing drizzled all over, topped with red onions, crispy bacon and parmesan cheese. You eat this caesar salad with a knife and fork or you could pick it up and eat it with your hands. I first had a grilled caesar salad when Kevin’s good friend, Eldon, made one for us when we were camping last year. He drizzled his in olive oil, fresh minced garlic, bacon bits and red onions, wrapped it in foil and grilled it on the bbq. I fell in love instantly. We ate it alongside our steak and potatoes while we sat around the fire, talked all night, drank copious amounts of wine and listened to the loons across the lake from our campsite. I recommend a couple glasses of wine with this salad. Everything is better with a couple glasses of wine. No? What goes into a Caesar salad? What is in a traditional Caesar salad? What is the heart of the romaine lettuce? The heart of the romaine is the inside part of a head of romaine lettuce. The leaves are tender and sweet and perfect for any salad. They are also more compact than the rest of the leaves which makes them easy to grill. 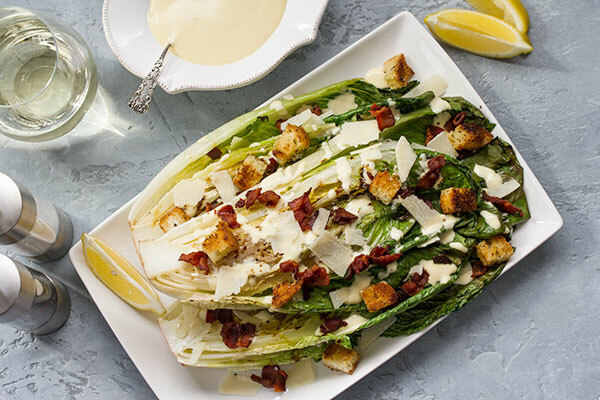 We use hearts of romaine in this grilled caesar salad. You can buy them in any grocery store, usually in a pack of 3. 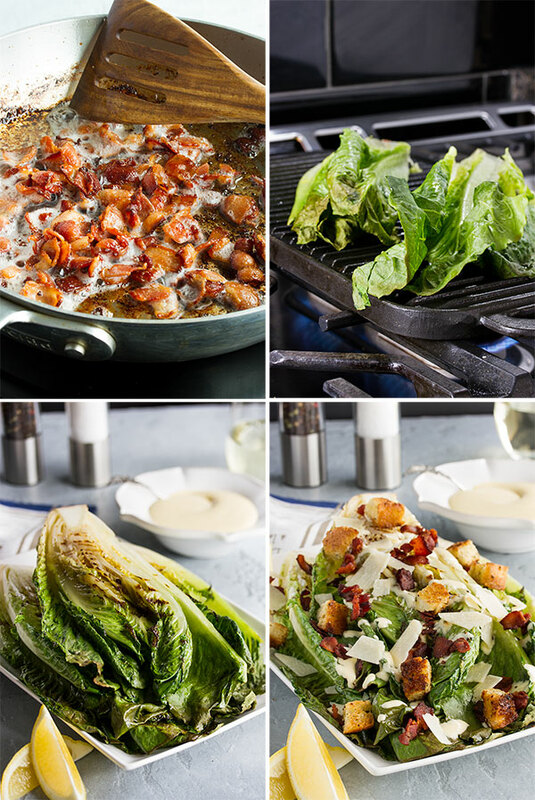 How do you make grilled Caesar salad? Its simple! First get your toppings ready. Chop and cook your bacon, get out your croutons or better yet, make your own amazing croutons, chop your onions. Make the caesar dressing. Get all your ingredients except for the oil into a good blender or food processor. Blend those up until they are smooth and then pour in the oil VERY SLOWLY as the blender or processor is on. The mixture will become thick and beautiful! Season with salt and pepper and pour into a serving container. Heat up your grill and when its nice and hot, cut your romaine hearts in half and brush them with a little olive oil. Place the cut part down on the grill and grill for two or three mins or until the greens start to wilt just slightly and you have nice grill marks on them. Take them off the heat and place half a heart on a plate, top with your toppings and the dressing, Serve right away. I am going to go out on a limb here and announce that this is the best Ceasar salad and dressing that I have ever had! try our homemade croutons with this salad – if you have never made your own, you are in for a serious treat! potatoes with garlic and dill – our favorite! this hibiscus lemonade sangria or our blackberry & peach sangria are perfect bbq cocktails and always great for entertaining! If you’ve tried this pickled beet salad recipe then don’t forget to rate the recipe and let us know how it turned out in the comments below. We love hearing from you! 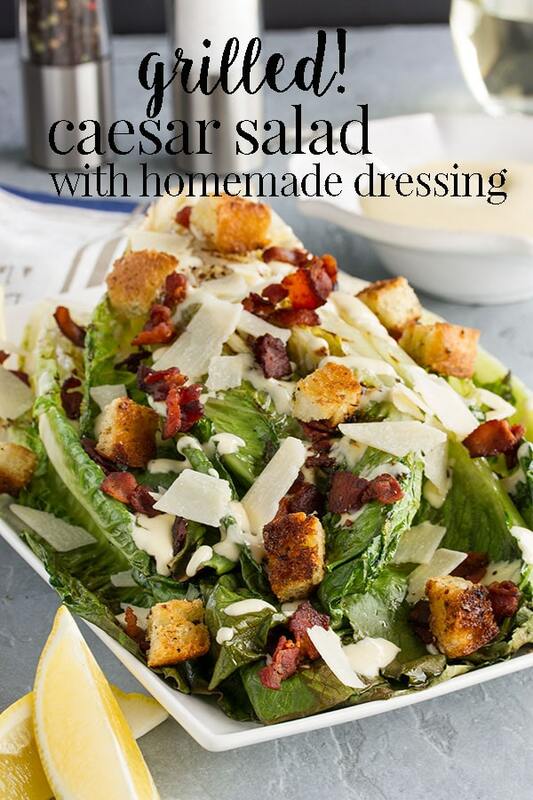 This delicious grilled caesar salad is a fun and classy way to serve a caesar salad to guests and especially great for a backyard BBQ with your family and friends. It's delicious with some little charred bits and the homemade caesar dressing is so easy and good. You will never buy caesar dressing at the store again! 2 cloves garlic red russian is best! Throw all the ingredients except for the oil into a blender and blend it up till its nice and smooth. Add the oil VERY SLOWLY into the top of the blender while the blender is running. The dressing will get nice and thick. Put it in a container and keep it in the fridge till your ready to use it. Get all your toppings ready. Chop and cook the bacon in a hot pan until nice and crispy. Spoon it out onto paper towel and set aside. Chop the onions, get out the croutons (or make your own!) and parmesan cheese. Heat your bbq to medium-high heat. Slice the romaine hearts in half. You want a half for each person that you are serving. When you bbq is ready, brush each half of romaine with a little olive oil. Place the cut side down on the grill and grill the romaine hearts for about 3 mins or until you get nice grill marks and some of the lettuce just begins to wilt. Remove from the heat. Drizzle a couple tbps of dressing on each serving, then sprinkle on red onion, cheese, bacon, and croutons. Serve right away. Question on the grilled ceasar salad with creamy cashew dressing. Parmesean cheese listed twice in the recipe. Is the cheese shredded when put in the mixer with other ingredients, then more grated on top when serving? yes, exactly. The 1/4 cup goes into the dressing, and then the rest gets grated on top.